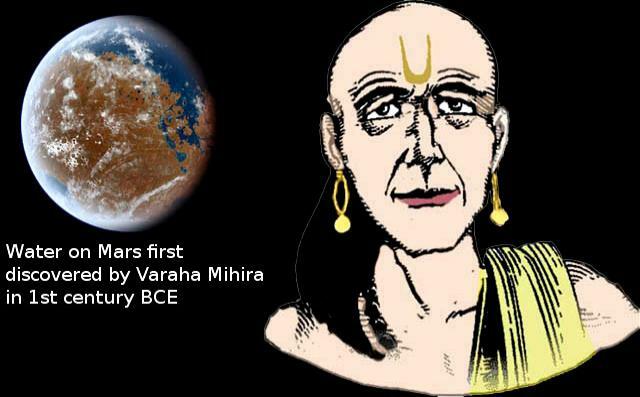 Varaha Mihira, astronomer, mathematician, astrologer of 1st century BCE was first to discover ‘Water on Mars‘. He was in the court of King Vikramaditya, who ruled India and neighbouring countries during that era. On this king’s name, a hindu era called as Vikramarka Saka started 56.7 years ahead (in count) of the solar Gregorian calendar. Varahamihira was born into a family of Brahmins. His father, Adityadasa was a worshipper of the Sun god and he taught astrology to his son. His original name was Mihira (synonym of Sun god) and he belonged to a family who worshipped Sun as god. Mihira proved his astrological skills by predicting death of 5 year old King’s son due to Varaha, when all other astrologers predict long life for him. King kept his son in a highly secured tower palace, based on single tower with only one extrance/exit. He ordered soldiers to check on all wild animals and keep them miles away from his son’s palace. However, King’s son, who was playing with flagpost on terrace, tried to pull it down and the metal Varaha idol (Varaha avatar of Vishnu was worshipped by King’s family) placed on top of flagpost, fell on him. The kid was killed by metal Varaha’s unicorn. King arrived at the time, when Varaha predicted death of his son and found the dead body pierced by Varaha’s sharp unicorn. King Vikramaditya applauded Mihira’s accuracy in astrology and renamed him as Varaha Mihira. Analysis of Shashtyamsa chart (D-60) was explained by Varaha Mihira, along with Moola Dasa timings, which indicated results coming from moola (root) of past life events/deeds. Much before many other scientists and sages, Varahamihira declared that earth was Spherical. His books Pancha Siddhantika and Surya Siddanta gave detailed reports of solar system, planets, their sizes, comets etc. In the history of science he was the first to claim that some “force” is keeping bodies stuck to the round earth (after Prasnopanishad and Surya Siddhanta). This force is now called gravity. He also proposed that the Moon and planets are lustrous not because of their own light but due to sunlight. Varahamihira’s main work is the book Pancha Siddhantika (Treatise on the five Astronomical Canons). The work it seems is a treatise on mathematical astronomy and it summarises five earlier astronomical treatises, namely, the Surya Siddhanta, Romaka Siddhanta, Paulisa Siddhanta, Vasishtha Siddhanta and Paitama Siddhanta. In Pancha Siddhantika, Varahamihira estimated diameters of the planets, like Mercury, Venus, Mars, Saturn and Jupiter. He calculated the Mars’s diameter to be 3,772 miles, with an error around 11% of the currently accepted diameter of 4,218 miles). Apart from these, Varahamihira also wrote about the presence of water on Mars (Chapter XVIII). This book had a detailed description of planet Mars. He also wrote in his book that planet Mars has both water and iron present on its surface, which have now been revealed by NASA and ISRO. His Surya Siddhanta is not found in India now (though some part is included in Pancha Siddhantika) and many assume that it was stolen by invaders and carried it to the west. Well known arabian travellers Ibn Battuta (14th century CE) and Al Biruni (10th century CE), came to India and wrote in their books that, german scientists already came to India and took copies of VarahaMihira’s works for their study.